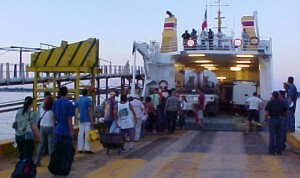 The Ferry Guaymas to Santa Rosalia Mexico transports both cars and passengers from Guaymas to Santa Rosalia, Baja California. Departures: Tuesdays, Thursdays & Saturdays at 8:00 p.m. Returning from Santa Rosalia to Guaymas on Wednesday and Friday at 8:30am and Sunday at 8:00pm. LUNES – – – 6.00 AM. ‹ Do You Need Passport to go to Mexico?